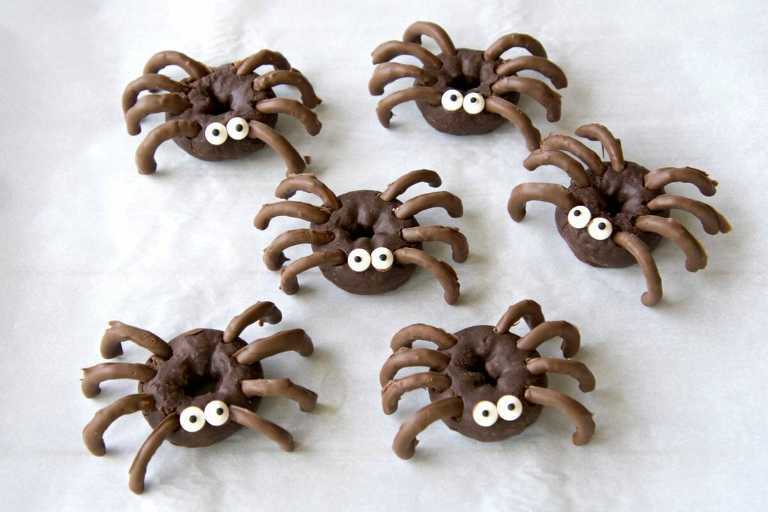 These mini chocolate donut spiders are an easy no-bake treat made with only four ingredients! Perfect for your next Halloween party! 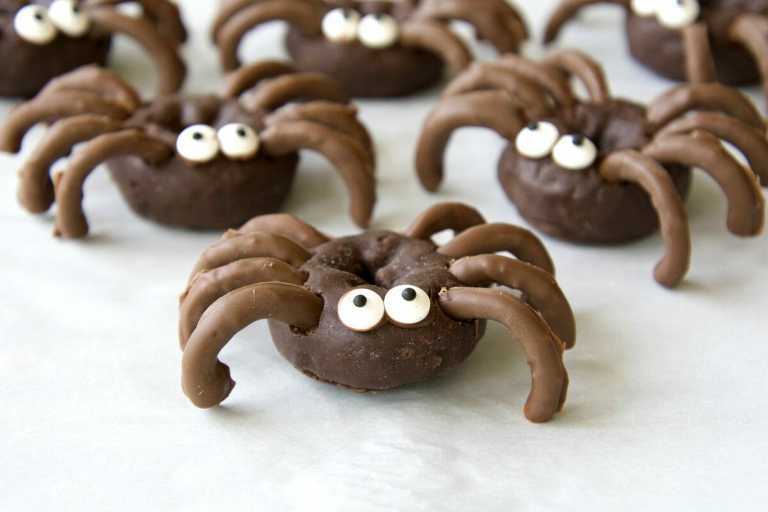 These adorable mini chocolate donut spiders have it all. They are an easy, no-bake holiday treat that is only four ingredients! The kids can help make them, they are so cute and they taste good too. What!? 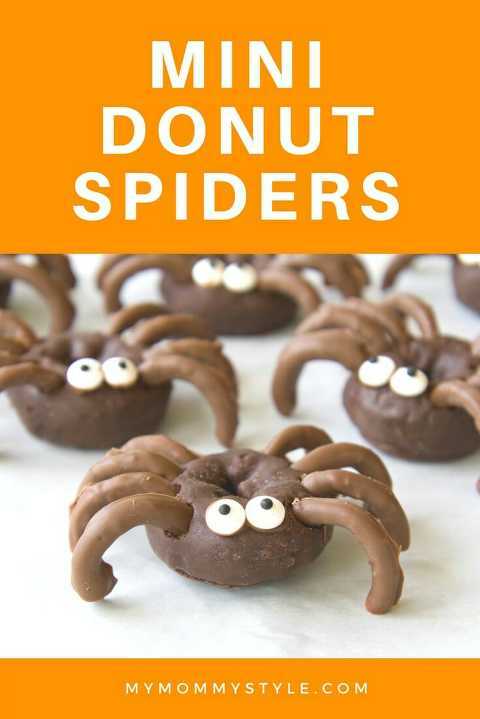 When I’m planning a Halloween party these little donut spiders are definitely on the menu because those are all things on my list for the perfect treat. There are a few ways you can make these spiders. You can Leave the pretzels plain for an even faster donut spider or you can dip the pretzels in melted chocolate. It’s one additional step, but because I love chocolate pretzels it is worth it for me. And I love that the legs of the spider match the chocolate donut. To make the spider legs super easy use round pretzels and cut them in half. I found a big package of round pretzels at my grocery store, but you can also find round pretzels here. I use melted chocolate flavored coating to dip the pretzels, such as this Almond bark or Candiquik or Wilton Candy Melts, but feel free to use whatever melting chocolate you prefer. Melted chocolate chips would probably work too. Enjoy these adorably creepy donut spiders at your next Halloween party! An adorable halloween treat made from mini chocolate donuts and pretzels. With a sharp knife cut the pretzel rings in half, each half will be one leg of the spider. Cut enough for each spider to have eight pretzel legs. Melt the candy coating according to package directions, dip each pretzel half in the melted candy and set on parchment paper to dry. When the legs are completely dry stick them in the chocolate donuts to make the legs of the spider. Dip each candy eye in a little candy coating and stick on the front of the donut.